Showtime in the Lotto Arena today! The first qualifications of the Age groups 12-18 and 13-19 are on the schedule. The gymnasts perform their first routine today. The day had started off with a bang in the rhythm of vibrant tempo routine performed by the Ukrainian Mixed Pair Volodymyr Holiak and Anastasiia Stetsiuk to the sound of I’m an Albatross. The Pair has been awarded 26.050 which was the first score of the day. As expected, the competition has been fierce as the level of the exercises was no less than extremely high. After the qualifiers Great Britain’s Jordan Franklin and Ella Hanna Sanz are in the lead with smashing 27.900. The 11-16 bronze medallists from Putian and reigning European Champions beat the Russian pair by impressive 0.850. Behind the Russian pair with 0.060 point difference, placed the Home Nation’s Seppe Beyens and Margot Bogaerts. The podium standings were closely followed by Portugal’s Pedro Malato & Ines Semedo who won in February won bronze in Antwerp in the Flanders International Acro Cup. Will Antwerp be their lucky place again? Today’s competition was a promise of a great show tomorrow. Israel’s Pair who incorporated some beautiful bendy shapes into their tempo routine, left the audience hungry for more before tomorrow’s balance qualifiers. The competition between Israel, Kazachstan, USA and the second MxP from Portugal was very intense and all of point differences between the 5th and the 12th position are very small, ranging from 0.02 to the maximum of 0.1 point! In the 9-12 positions there are 2 pairs from Germany, one from Bulgaria and one from Poland. Both German pairs come from Sachsen from clubs with a long Mixed Pair tradition. Florian Borcea-Pfitzmann And Samira Rawolle Are From Dresden, which was a home club to Tim Sebastian, who before becoming the World Games Champion in a Men’s Pair was in a very successful Mixed Pair. Sascha Jeriomkin and Xenia Bartel represent SC Hoyerswerda, which had a Mixed Pair representation in every world Championships for the last 10 years, but same as with Portugal - only one of them will be able to gain a spot in the final. Bulgaria’s Ivaylo Lyutskanov and Mihaela Velinova engaged the crowd with the energetic routine and proved that we haven’t seen the last of them yet. Finally in the 12th place ther is Poland’s Nikola Kaminska, Michal Wrobel coached by the former Women’s Pairs World Champion Brygida Sakowska-Kaminska. Who will make it in the final? A pair from Austria also deserves a special mention. Due to audio malfunction the pair had to finish their routine with no music. They still performed their routine until the end, enthusiastically applauded by the crowd. That’s the spirit! The Women’s Pairs competition also did not disappoint. The competition has been launched by the Belarussian Women’s Pair, Palina Kunouskaya and Anastasiya Shalayeva. Their soulful routine has put them in the 10th position after the qualifiers. Nelle Van Der Taelen finished 4th only 0.05 behind the US and Israeli pairs that drew with 27.600. Israel’s Almog Green and Maayan Zunenshine topped the US with 0.1 poin for Execution and therefore they are in the 2nd position with US following in the 3rd position. Both British and Australian pairs presented a very solid routines that put them in 5th and 6th position respectively, with only 0.02 difference between them! As in the Mixed Pair competition, the difference between second Israeli pair, Portugal, Netherlands and Belarus are marginal and tomorrow’s second qualifier will be very close. Russia’s double Darinas concluded the Women’s Pairs competition and left everyone amazed with their difficulty packed routine. After today’s fantastic performances one is clear – if everyone performs like they did today, tomorrow will be a fantastic spectacle. Well done to all gymnasts and coaches, we can’t wait to see what you’ve got in store for tomorrow. After the exciting morning session the second session saw the 12-18 Men’s Pairs, Men’s Groups and Women’s Groups competition as well as 13-19 Mixed Pair event. Russia’s pair has demonstrated their potential in the European Championships where they lost to UK’s pair Frazer Windows and Finlay Gray, who have now moved to the 13-19 category leaving an opening in the leader’s position. Currently in the second position is UK’s pair with Samuel Large, 11-16 gold medallist from Putian. After day 1 Belgian boys are in the 3rd position, not far behind the British team. In the 4th and 5th position Belarus and Ukraine are going head to head, they both made finals in the recent European Championship which left them hungry for more! With 9 teams in this category only 6 will go to the final. Currently in the 6th position there is a Pair from Rzeszow, Poland. Two brothers Konrad and Maciej Bilyk who crowdfunded to be able to compete here in Antwerp. Will their efforts be rewarded with a qualifying spot for the final? We shall see tomorrow. The Men’s Group event is always one of audience favourites. Today’s competition only saw 5 groups competing, but all of them presented spectacular routines packed with jaw-dropping balances. The Russian Group won today’s qualifiers by 0.55 over the UK’s group. The team amazed the audience with solid balance combinations and precise choreography. Women’s group competition as always was one of the busiest categories Today wasn’t any different, with 34 competing partnerships from all participating continents including USA, Canada, Australia, Azerbaijan and some European Nations that aren’t that frequently seen on the international scene, including Finland and Switzerland. Women’s groups are always an exceptionally hard category, because despite the large numbers it is still only 8 teams, who can make it to the final. As the Women’s groups started their qualifiers with tempo routines, we’ve seen lots of vibrant routines. Samba was the primary tune of that rotation. Belgium had two trios in this category and they both did really well finishing 6th and 8th. Russia however presented a more melodramatic routine with precise choreography and won this round with Israel following closely by 0.4. The bronze position is currently taken by Ukraine, with Netherlands just behind them with 0.1 difference. In the top 10 we’ve also got Great Britain, Kazakhstan and Portugal. The 10th position has been taken by a Canadian trio who by far had the most enthusiastic support in today’s competition. Keep up the good work team Canada fans! As you can see, the top of this ranking is really crowded with so many talented teams, so it is hard to make any predictions of the final qualifiers. We just have to wait and see! The 13-19 Mixed Pairs did they balance routines today. The competition was dominated by emotional choreographies. There have been some surprises as well as some mistakes that cost expected front-runners a position in the further end of the ranking. Everyone in the top 10 finished with a score over 27 points which again makes it very hard to make any predictions before tomorrow. The final rounds of the first day of qualifiers was the real cherry on the pie of today’s competition. Off to a great start with Women’s Pairs and Great Britain’s Stamatia Raftopoulou and Stephanie Ricketts who fantastically dealth with the pressure of the opening act and finished the competition in second position, losing only to another GB pair - Grace Monchar and Nyree Williams who only joined the 13-19 category this year. The podium positions completes the Israeli pair Kami Ram, Gali Rosenstein who also moved up an age group to a great result! Belarus performed a great merry routine which put them finally in the 4th position. In 5th Germany’s Gina Nickler and Pia Schuetze , 11-16 finalists from Putian. The burning question for Great Britain, Israel and France will be, which of their teams will be the one to make the final. We’ll find out tomorrow. In the Men’s Pair event we’ve seen plenty of familiar places, including the reigning 13-19 European Champions and 11-16 World Champions from Putian, Russia’s Artem Simonov and Andrei Zuev as well as 12-18 Balance and Tempo champions, UK Frazer Windows and Finlay Gray who have now progressed to the 13-19 age group to face the Russian Champions. Their rock’n’roll routine put everyone in the mood for dancing despite the late hour and awarded the boys the 3rd position behind another Russian pair, European Champions Timofei Ivanov, Maksin Karavaev. USA’s Angel Felix And Braiden Mcdougall have definitely earned the title of audience sweethearts – their funky routine, performed in a very expressive, almost theatrical way to extremely entertaining selection of looney tunes was probably the most applauded exercise of today, which finally put the boys in the 7th position. 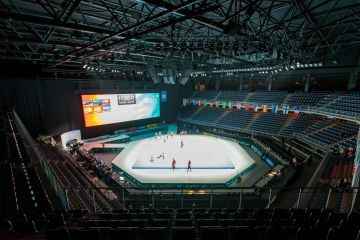 We’ve also seen some fantastic routines from Portugal, Belarus and Ukraine all of them are experienced players on the international arena and will surely continue to impress us tomorrow. In the Men’s Group competition in the 13-19 category, we have only see 4 performances, but in this case this was definitely quality over quantity. The 11-16 Champions from Putian did not disappoint again. Their mighty routine packed with high difficulty skills put them in the lead position. They were followed by Kazakhstan in the second place, with over 1 point advantage and in the final podium position was Ukraine. Again the busiest category of the last rotation were the Women’s Groups, we’ve seen some difficulty packed routines but the final performances were true gems worth waiting for all day. Portugal alluring trio that had swept all the medals in the 2017 European championships again charmed the crowed with their impressive performance. Their difficulty-packed routine with a beautiful and confident one hand balance was nothing less than amazing. Israel finished today’s marathon of gymnastics with a Bang! Their powerful and creative choreography earned them a whooping score of 28.780 put them in the first position. What an unexpected finish to a long day! Belgium’s trio performed a delightful, robotic-like choreography with a robot like precision. The trio worked in perfect synchronization, performed their balances with confidence and finally placed in a well-deserved 3rd position. Their unique choreography earned them a marvelous 9.150 artistry score. With 0.1 difference Belgium pushed Russia’s representation off the third position and moved the trio from Ukraine to the 5th position. Again the scores between the first 4 positions are extremely close and all teams from 5th to the 15th (!!!) position scored over 27 points so it is impossible to make any predictions. We just need to wait to see what tomorrow brings, one thing is certain, the competition will be even fiercer than today. You can check all results here. Thank you everyone for your support today and we’re looking forward to seeing you tomorrow!